The Toyota Highlander is one of the best mid-size SUVs you can buy and has been on the list of best family cars for years now. With its three rows of crossover seats, it has the capacity of accommodating 8-9 passengers. It’s an ideal family car with just the right size; neither too big nor too small. It’s an excellent car with amazing fuel average. Toyota Highlander also comes in a Hybrid variant that gives as high as 30 mpg fuel average. The car is loaded with top-notch safety features and the addition of panoramic sunroof makes it a winner best SUV, it also has a lower 5-year cost to own than most of its competitors. It has been given a rating of 9.3/10 by IIHS Safety rankings. The new Highlander comes with an inbuilt speaker system for the driver via which the driver can easily convey their messages to third-row seaters with the help of an intercom system. The flip-up glass window makes the loading and unloading of cargo easy in the hatch without allowing them the space to roll out in the back. The Toyota Highlander is one of the best SUVs to consider as any family car. It has it all covered for full family entertainment, it comes with 5 USB ports; 3 in the front and 2 in the rear to provide electronic plugins for everyone. Highlander has a very roomy interior which gives you a comfortable seating space for 8 passengers easily. The third-row seats are reclining; giving more comfort to the passengers. Toyota Highlander has designed the rear suspension to create additional cargo space to accommodate all your cargo needs. Apart from this, it has a 60/40 third split row seats which can be folded flat or reclined accordingly to meet your needs. The Toyota Highlander makes your journey noise free through its interior insulation. The Highlander has insulation along its floor which keeps the noise out of the cabin and the presence of acoustic type glass in the windscreen further reduces the sounds from coming into the cabin. The panoramic moonroof is definitely an in-seat entertainment for everyone. The passengers can enjoy the view of the complete sky as in a convertible but without the noise and the wind messing up your hair, a feature that makes us consider it to be among the best SUVs of these times. Another amazing feature in the Toyota Highlander that makes it one of the best SUVs is the 9’’ display screen for the rear seat.It comes with RCA jacks, remote and two wireless headphones. The Toyota Highlander is a very safe car. If you’re concerned regarding the safety of your family then the Highlander is the right choice for you. Toyota has ensured full time safety by providing the very best safety features in all Highlanders even the basic models have them making it a best SUV. All Highlanders come with an integrated Star Safety System which is a combination of six safety features that includes; Enhanced Vehicle Stability Control (VSC), Anti-lock Brake System (ABS), Electronic Brake-force Distribution (EBD), Traction Control (TRAC), Brake Assist and Smart Stop Technology. Toyota has ensured the safety of everyone in the Highlander, what more can you ask for in one of the best SUV & family car. 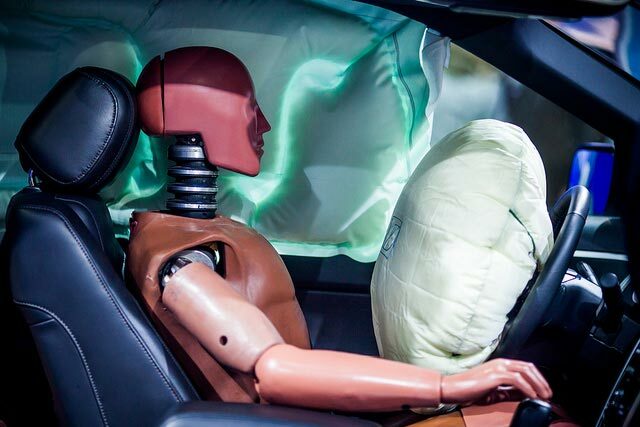 In Highlander, there are Airbags for the Driver, Passenger, Front-head, rear-head and Front side airbags along with a roll-curtain side Airbags for all sides as well. Highlander got it all covered for your little ones, All Highlanders come with LATCH i.e. Lower Anchors and Tethers for Children. It includes tethers on the outboard second-row seats and also on the middle seat of third and second rows along with lower anchors. The Toyota Highlander comes with anintegrated safety system which is a must feature for the best SUV. This system includes; Lane Departure Alert (LDA) with Steering Assist; the Lane Departure Alert and Steering Assist are usually functioning when the vehicle is above 34 mph. Steering Assist is a system which helps to keep your vehicle stable and straight when you’re unintendedly drifting of your lane, it functions automatically and keeps you in your very lane. This feature makes your highway experience more powerful. This feature enables you to drive at a preset speed and adjusts your vehicle to other vehicle distance by using a front-grille-mounted radar and an in-vehicle camera. This helps in detecting other vehicles and their distances from your Highlander. DRCC becomes operational whenever there’s a vehicle in front of you which is driving slower than you; whenever the lane gets cleared the car is turned back on cruise control. Highlander’s in-vehicle camera and radar enable you to detect the presence of other nearby vehicles and pedestrians. With its Pre-collision system (PCS) with pedestrian detection it will alert you in chance/case of any frontal collision and if you are not able to apply break it will automatically slow down the car as well. This feature is a must-have for best SUVs. This is a safety feature added to facilitate your driving experience during the night. AHB enables you to see more clearly at night without blinding other drivers. AHB gets activated at speeds above 25mph. it relies on the in-vehicle camera which helps it in detecting the headlights of oncoming vehicles and tail-lights of the passing ones, then it automatically adjusts between high beams and low beams accordingly to provide the right amount of light needed to drive. Toyota Highlander is the right choice for you if you are opting for a family SUV. It is the best SUV for a cross-country ride and a perfect road trip vehicle with its comfortable seatings and spacious rear it can load all your cargo without any trouble. With its panoramic moonroof, you can enjoy the complete view of the sky. This best SUV offers a perfect combination of crossover vehicle; a car-like truck or a truck-like car the Highlander has all the good features of the good old station wagons. The SUV comes equipped with 17” wheels, heated outside mirrors, a windshield wiper de-icer, power adjustable front seats, a fold-flat third-row seat, a perfect JBL sound system, rear seat DVD based entertainment system, leather upholstery and navigation system. The most happening entertainment systems Apple CarPlay and Android Auto are still missing which can be found easily in other competitor cars of this range. The third row is very tight and uncomfortable for adult sitting.